The BDS-Holes continue to show their true colors, with a Scottish one jailed for throwing acid on a woman manning a Kedem stall. A pro-Palestinian activist who carried out an acid attack against an Israeli-owned stall in Scotland has been sentenced to a year in jail. His lawyers are filing an appeal against the 12-month sentence for assault to injury, which was handed down by a Scottish court earlier this week. He is currently being held in custody pending the results of his appeal. A quick-thinking colleague poured five liters of water on her head, saving her from the worst effects of the mystery liquid. 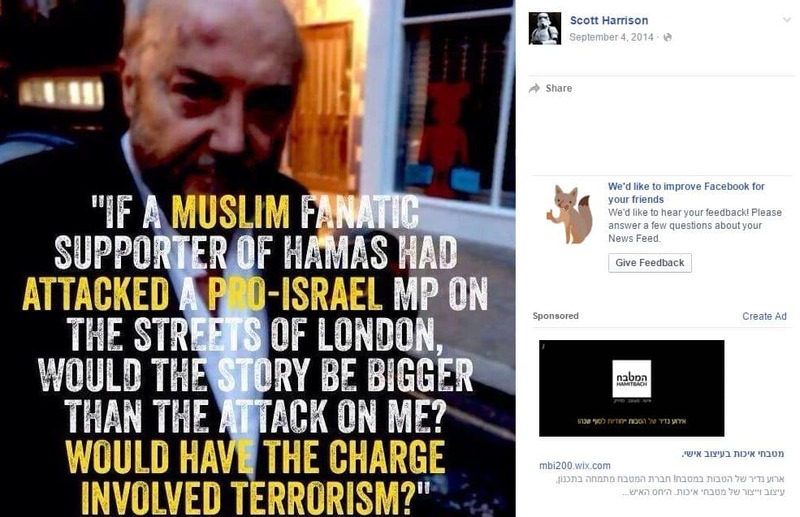 And besides hatred for Israel, his Facebook profile reveals some laughable hypocrisy. Against physical attacks on people, are you? A year for this crime is not enough time. I can only hope his bunkmate Bubba makes the most of that year. I’m in Glasgow and i’ve also heard nothing of this. A mutual friend of the guy who had a link to his FB profile posted assures me that he is not the person in question and simply shares a name with him. “Likely” is not evidence enough when accusing someone of a hate crime.